The primary job of a battery charge regulator is to prevent battery damage through over-charging. All regulators gauge the state of charge of the batteries by accurately measuring the battery terminal voltage. To do this effectively, it is important that any voltage drop between the battery and regulator is kept to a minimum. This is best done by mounting the regulator close to the batteries and keeping the cable run as short as possible. As batteries emit the inflammable gas, hydrogen, when under charge, there should be no potential source of ignition within the battery compartment. An ideal mount site is therefore the reverse side of a bulkhead which forms part of the battery compartment. Where space constraints make it impossible to mount the regulator close to the batteries, a suitably heavy gauge of wire should be used to extend the cable between the regulator and batteries in order to avoid voltage drop. Where the regulator has the option of fitting a separate voltage sense wire, this should be fitted. 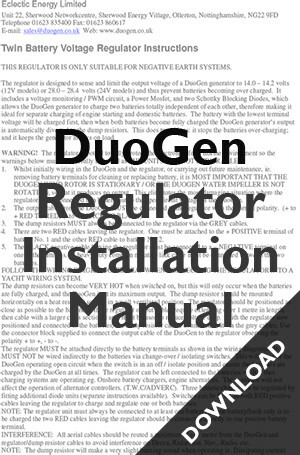 ‘Shunt’ or ‘dump’ type regulators are required for wind and water generators. These regulators divert power away from the batteries to the dump loads once the batteries are fully charged. The dump loads are power resistors and can come in a variety of forms. The most common are ceramic coated tubular types, but equally they could be in the form of a plate, or something that resembles a toaster element. The purpose of the dump resistor is to keep the generator on load and prevent it from over speeding. The surplus energy from the generator is dissipated by the dump load as heat. Dump resistors are rated in line with the capacity of the regulator, and in turn the regulator is designed to handle the full output of the generator. Therefore, potentially 500 watts could be dissipated by the dump load. In these circumstances, the heat from the dump resistors is equivalent to half a bar of a 1kW electric fire. Owners are often concerned about this and potential fire risks. However, if properly installed there is no problem. Firstly, the dump loads will only get very hot when the batteries are fully charged and input power is very high. This would only occur in gale force winds for a wind generator or at high boat speeds for a water generator. Secondly, the resistors are air cooled. They can be mounted in an enclosed space such as a locker, as long as air (driven by convection) is free to circulate around them. It is preferable to mount them horizontally so the maximum volume of cooling air passes over the resistors. 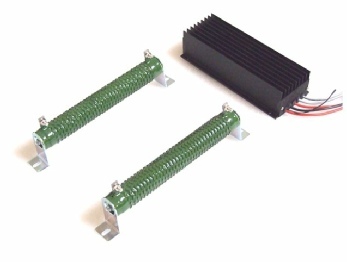 The resistors should be mounted securely using the mounting feet or studs supplied. There is generally no problem in mounting to plywood or GRP panels, but do not mount directly to thermoplastics which may melt with heat. An aluminium or stainless steel plate can be added under the resistor to provide a heat shield for the surface. The dump resistors should be positioned close to the regulator where possible. If they have to be sited further from the regulator, a heavier gauge of wire should be used to extend the cables. Take special care to ensure that dump loads are not installed in a position where they may have clothing or sail bags accidentally placed on them. As with all electrical installations, care should be taken to ensure that all connections are sound and secure. 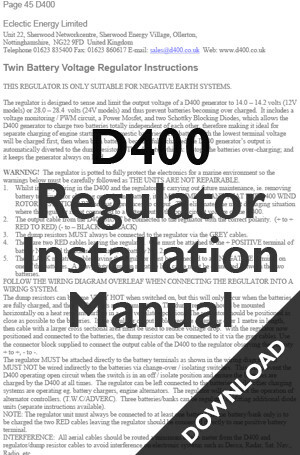 Detailed installation instructions are supplied with each make and type of regulator, but this broad guidance is equally applicable to them all.